One of my biggest regrets of 2013 was never getting a chance to review Pharmakon’s proper debut album, “Abandon.” Pharmakon, industrial-noise based project of Margaret Chardiet, is one of the harshest acts out there, and “Abandon” still serves as just a brutal listen start to finish. Due to unforeseen health circumstances, Chardiet had to cancel the first major Pharmakon tour and get emergency surgery. While she was recovering, she wrote a follow-up: “Bestial Burden.” The album is menacing and brutal, more inward and deprecating, but also with its moments of honesty and musicality. I take notes when I listen to albums. For the first track, “Vaccuum,” my notes only say “just breathing.” It’s an intro, one that is just the sound of heavy, panicked breaths. Sure, it’s nothing compared to the sonic assault of “Abandon,” but it sets the album’s tone. This album is frantic, not just devoted to volume but to dissonance and to issues of health and well-being. The first true track, “Intent or Instinct” is noticeably more industrial than anything on “Abandon.” For eight and a half minutes it soldiers on – the first scream comes in around the three-and-a-half minute mark, and the industrial beat never sways, even as the screaming gets more intense. This constant, industrial tone is one that stays throughout the album. It marks a departure from the abrasive synth blasts of before, although it is still an assault on the ears. But the album is structured in its noise. The tracks have steady, unfaltering industrial beats that oftentimes border on the verge of being rhythmic. Or at least, consistent. 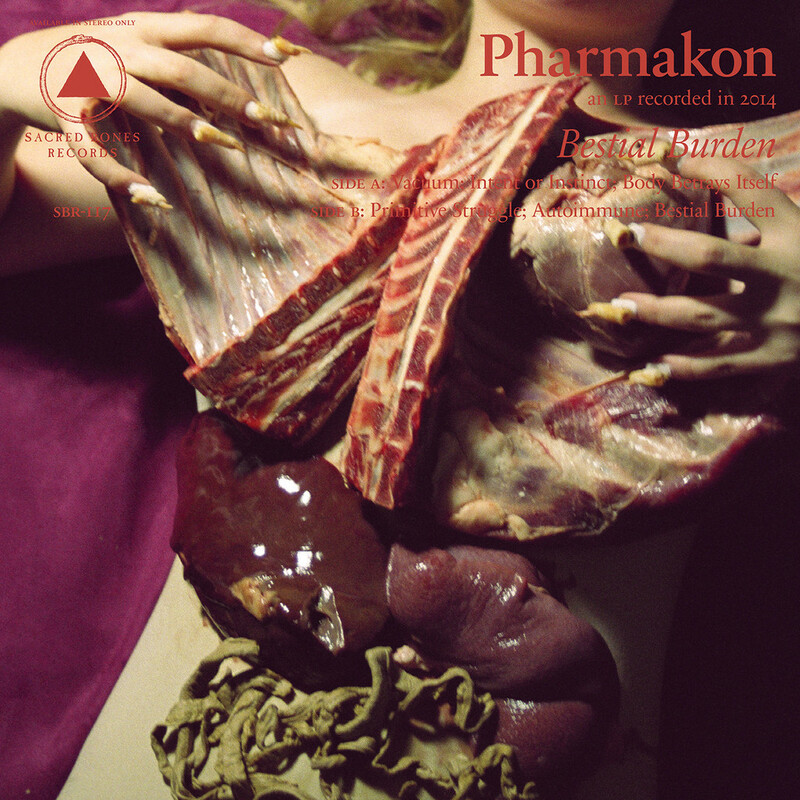 Pharmakon have always had a way of finding rhythms in pure noise, but this album does it more cleanly and more directly than before. After Chardiet had to undergo emergency surgery before her first European tour, she began writing a more introspective work. This album is the result. It’s noticeable in the album covers alone – “Abandon,” with a pair of skinny legs (presumably Chardiet’s), covered in maggots, to this one – insides. This album is inside the body. Songs about health and the body. The title track has the repetition of the line “I don’t belong here,” coupled with laughing. Both “Abandon” and “Bestial Burden” have bonus tracks, and they’re indicative of the albums themselves. “Sour Sap,” from “Abandon,” is a blistering 27 minute hell journey through screaming and pure white noise. But “Bang Bang,” on “Bestial Burden,” is the straightest song Pharmakon’s ever done. Sure, it’s about getting murdered, but it gives Chardiet a chance to actually sing, instead of screaming, and she has a pretty accommodating voice. The longest track on “Bestial Burden” is “Intent or Instinct,” at eight and a half minutes. Though longer than any of the non-bonus songs on “Abandon,” the album’s songs feel shorter. And they are – there’s more shorter pieces, instead of a few long ones. It allows the album to feel like a journey through the mind and body; a disturbing trek through a broken and disturbed being. Interlude “Primitive Struggle” is just a man coughing over an increasingly fast heartbeat – so simple, but so demanding. To jump into Pharmakon, you have to know to expect screaming, slammed-down synth notes, and a perpetual feel of pure terror lurking around the corner. “Bestial Burden” takes an inward stance, and the result is more structured, but no less full-frontal. If “Abandon” challenged insanity, then “Bestial Burden” challenges injury. It isn’t for the faint of heart. It’s abrasive and brutal, almost palpable in its intensity. Industrial-noise is called so for a reason, and although the album might not be as immediately terrifying or numbing as “Abandon,” it is still confounding and abrasive, and only for the most committed and toughest listeners. Have fun picking through it, Pharmakon is here to stay. If you like this, try: Spinning Death Grips records backwards or something, I have no idea. Reblogged this on Reverse Records UK.